The weather in Granada city is very different to that on the Granada coast. The coast has fairly mild temperatures all year round, and does not get as hot in summer as it does further inland. 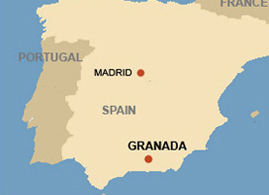 Granada city has very hot summers, when rain is virtually non-existent. However it is not an uncomfortable heat because of the low humidity. The winters by contrast are fairly cold, although the fact that the days are generally sunny means that the daytime temperatures remain pleasant. La Alpujarra has its own unique weather system as the combination of mountain air and valleys in La Alpujarra make the weather more changeable and the weather can change during just a short journey from village to village, and from different altitudes. Summers are often hot and dry, with temperatures reaching around 35ºC . Rain is rare, but can occur in the higher mountains, however it never lasts long. Winters are still quite warm and relatively sunny during the day, but can be a lot colder at night after the sun has gone down.